Lyon Nevada, Cu, Au, Fe prospect is near Yerrington (?). and is a skarn type deposit. Samples were collected from a drillhole CL301 at depths from 359 to 409 feet. Note the degree of variation over this short distance. 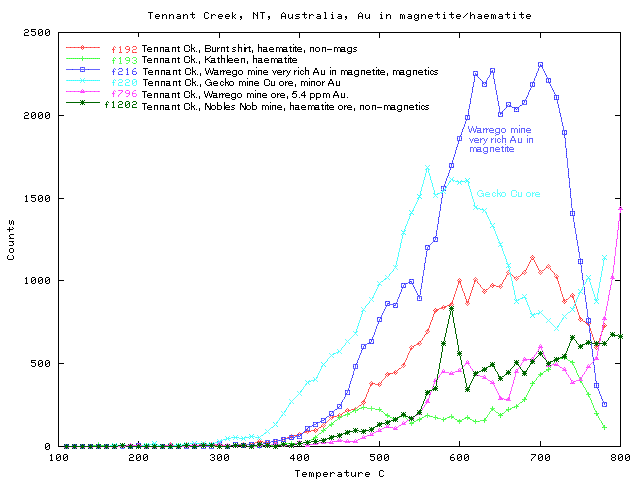 Zonation of magnetite is also common at Tennant Creek, NT. Kingston Summit, Nv (on Ca border?) is a defunct Fe(?) mine in a skarn magnetite. Samples from this mine show even more intense decrepitation than the Lyon samples. 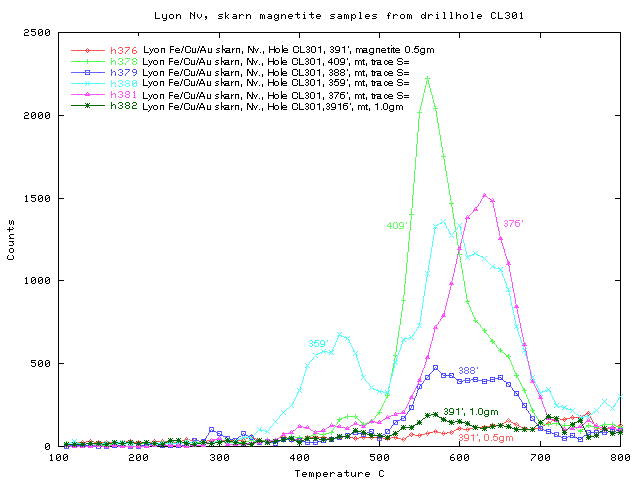 These samples collected from the roadside show intense decrepitation in magnetite, with very variable patterns. Samples 1340 and 1345 are the same sample, with 1345 being washed in acid to remove potentially interfering carbonates. In this case the 2 results are the same and so carbonate contamination has not been a problem. 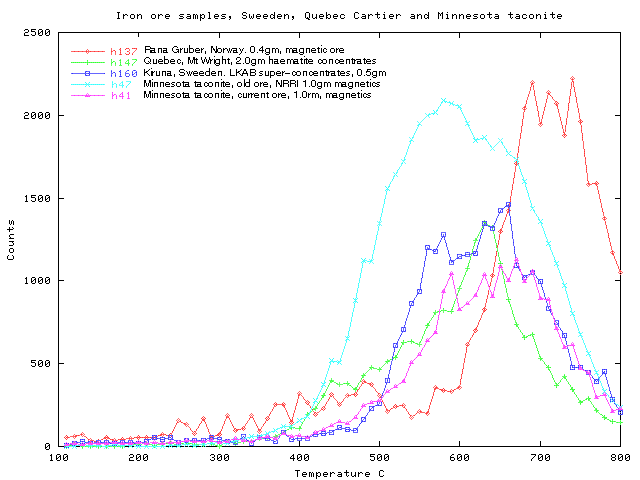 Assorted iron ore samples from Sweeden, Quebec and Minnesota often show intense decrepitation. 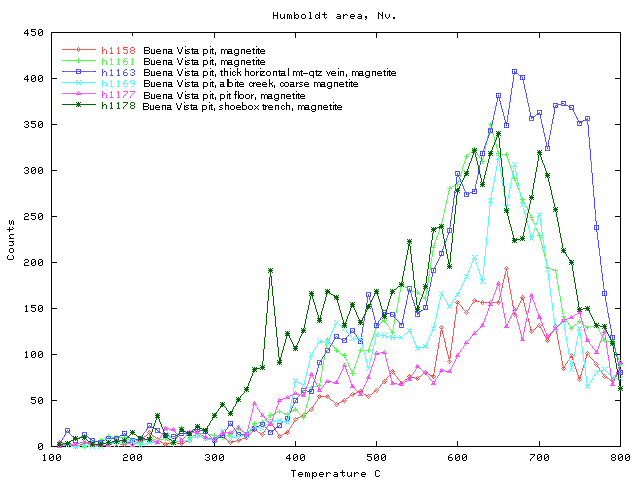 In this plot, sample 137 is from Rana Gruber, Norway; 147 is from Mt Wright mine, Quebec; 160 is from Kiruna, Sweeden ; 47 is the old ore from Minnesota and 41 is minnesota taconite (current ore). This was mined for iron ore, but is now defunct. The ore is dominantly magnetite, with scapolite common. It has been suggested to be of magmatic origin but may be a replacement deposit. The temperature of such replacement is disputed and there is no syngenetic quartz from which to derive fluid inclusion temperatures. 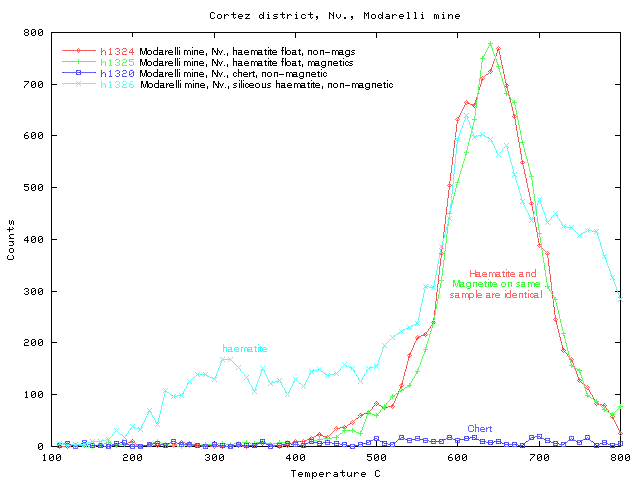 The decrepitation response in magnetite samples varies widely but does suggest the involvement of high temperature fluids. The following plots have been divided up with high intensity and low intensity samples in seperate plots for scaling convenience. 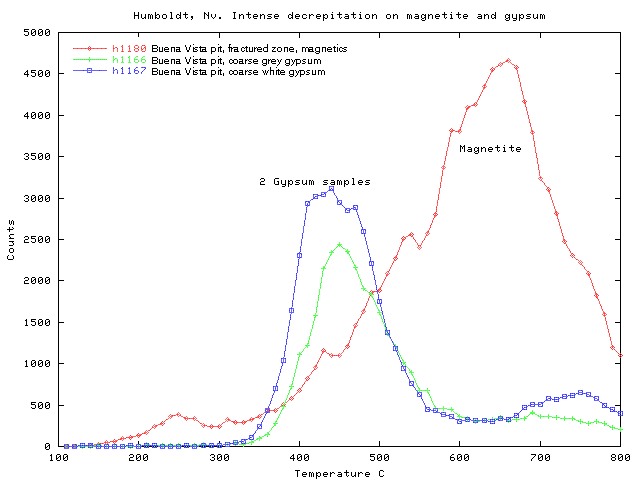 Note the lower temperature of the gypsum samples compared to magnetite. Good samples were hard to find here, but these 2 samples have much lower decrepitation and perhaps higher temperature than the nearby Buena Vista samples. Barth Mine, Cortez District, Nv. 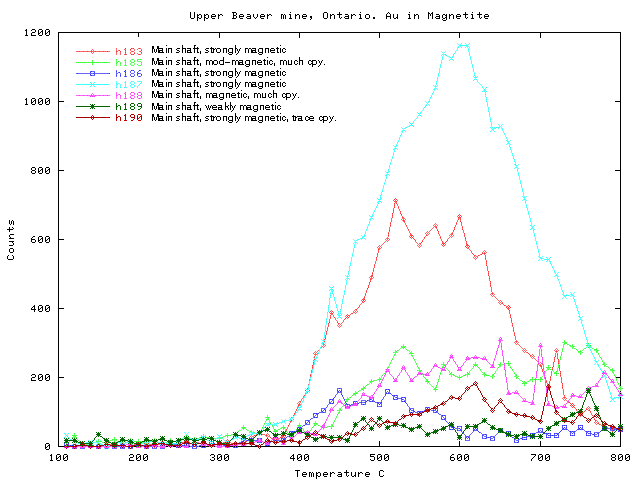 Non-magnetic samples from this mine show very weak decrepitation only and magnetic samples have no decrepitation recognizable above background. All samples were collected from the (extensive) old mine dumps as no pit access was possible. This old iron mine is now defunct and is hosted in rhyodacite. 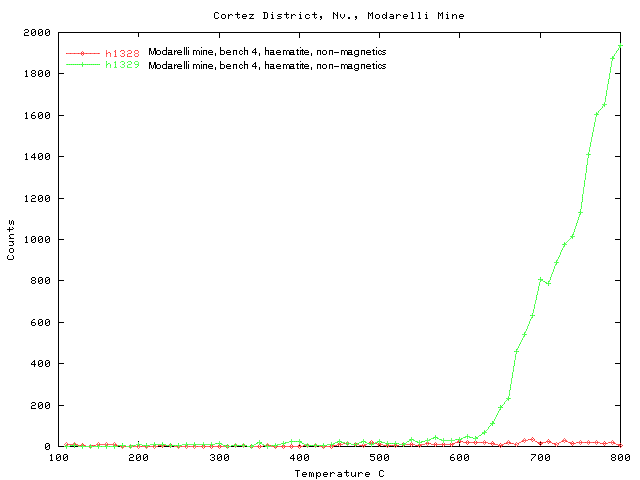 Most samples from the mine itself had very low decrepitation. Samples were also collected from loose float material on the road access near the mine. These may be of alluvial origin, but these showed the best decrepitation responses in the area. 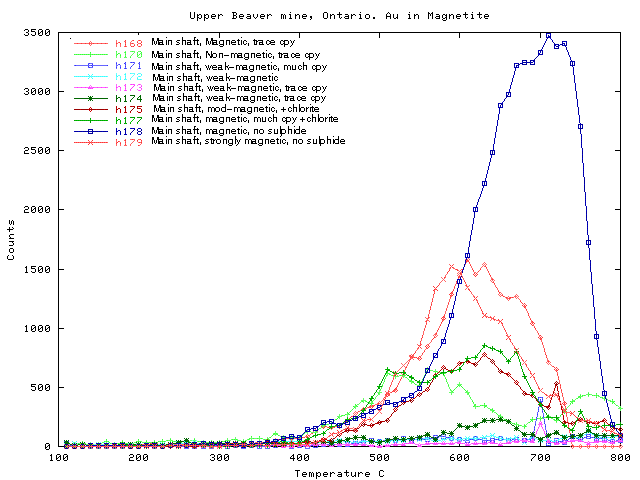 Note that 1324 (non-magnetic) and 1325 (magnetic) are splits from the same hand specimen and show essentially identical decrepitation response despite the change from magnetite to haematite. 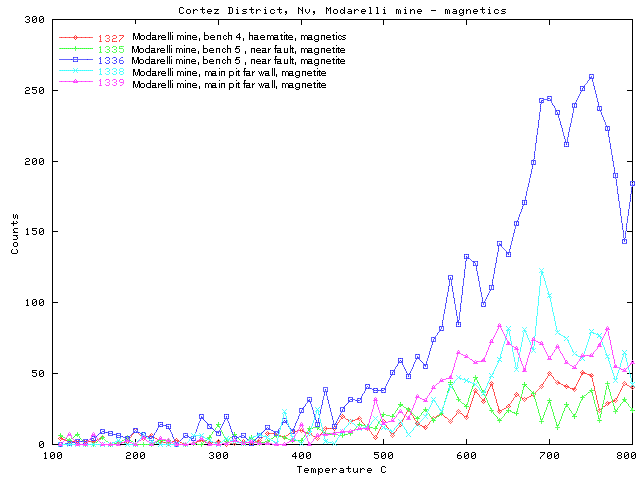 Samples from the mine benches show low intensity decrepitation at almost background levels with barely recognizable peaks near 650-700 C.
It was difficult to find magnetic samples in hand specimen at this mine. 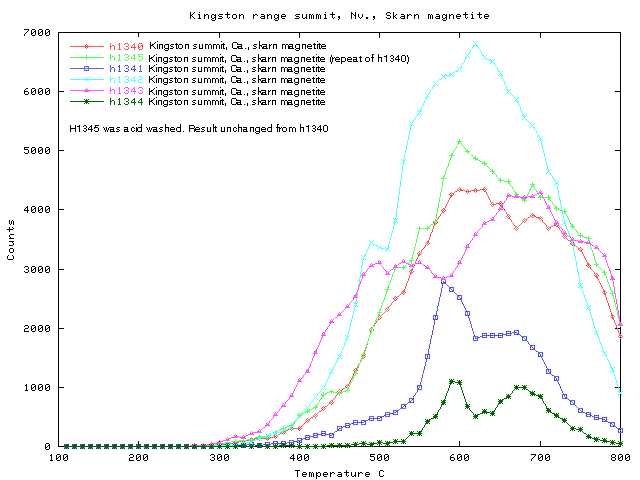 The magnetic samples collected show no significant difference in decrepitation from the non-magnetic samples, with the exception of sample 1336. However, even this sample was of only low decrepitation activity (<300 counts max.) 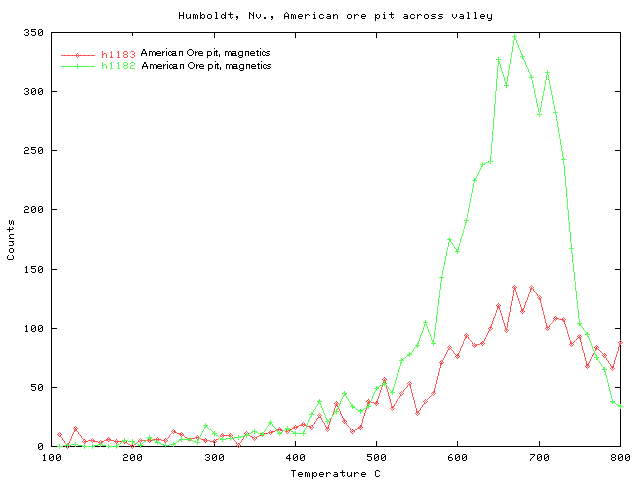 compared to the magnetite float sample from the access road float sample from the access road (1325, above) or from other deposits. 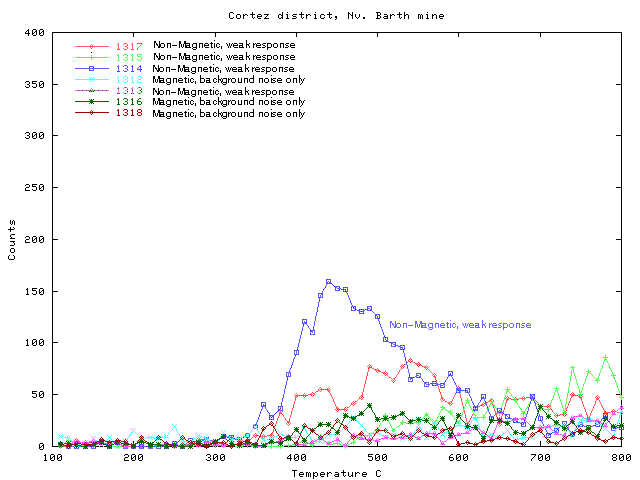 On Bench 4 of the mine, 2 non-magnetic samples were collected at the same sample site and these show marked difference from no response to quite intense despite their identical location. 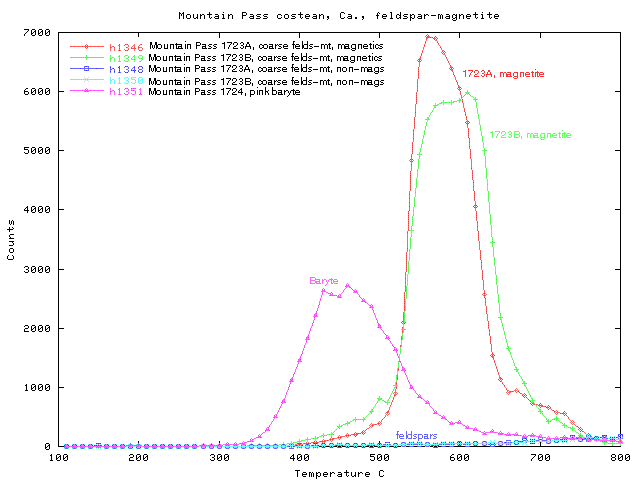 Two feldspar magnetite samples were each separated into magnetic (magnetite) and non-magnetic (feldspar) fractions for analysis. 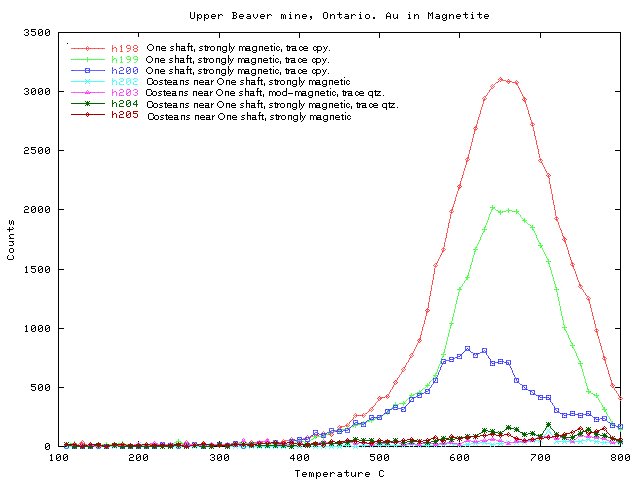 The magnetite gave very intense decrepitation, with an unuaually narrow temperature range of decrepitation. Note that a magnetite sample from a carbonatite pipe near Kapuskasing Ont. 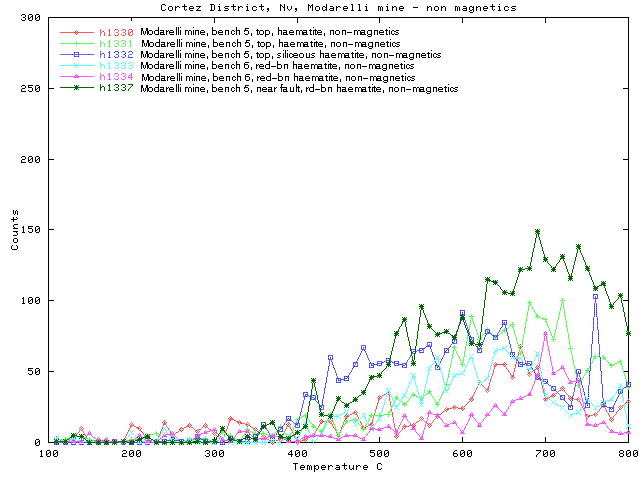 also gave a narrow decrepitation temperature range.) The co-existing feldspar however, gave almost no decrepitation, and that decrep[itation was at much higher temperature than the magnetite. One sample of baryte was also analysed and it gave intense decrepitation at a markedly lower temperature. The genetic relation between the baryte and feldspar-magnetite is unclear. 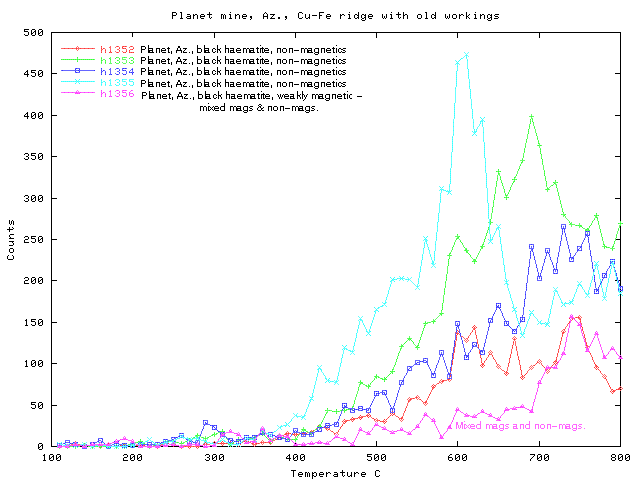 The old workings occur on a single ridge, and all the FeOx samples here are non-magnetic. 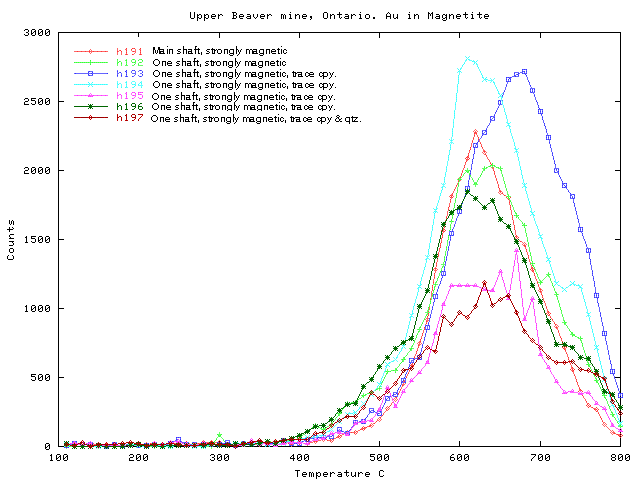 Only one sample (1356) was weakly magnetic. These samples show lvery weak decrepitation only. To the north, the next hill shows abundant brecciation textures and although there are no old workings, the samples give reasonably intense decrepitation over a wide temperature range. 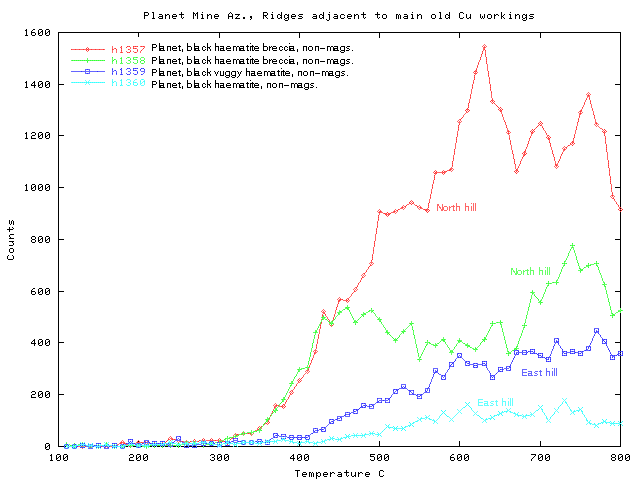 Samples 1357 and 1358 are from the ridge to the north which shows abundant brecciation and samples 1359 and 1360 are from the ridge to the east, where brecciation was not observed. Sample descriptions, Planet Mine area Az. These old workings are in massive magnetite which has intense decrepitation. 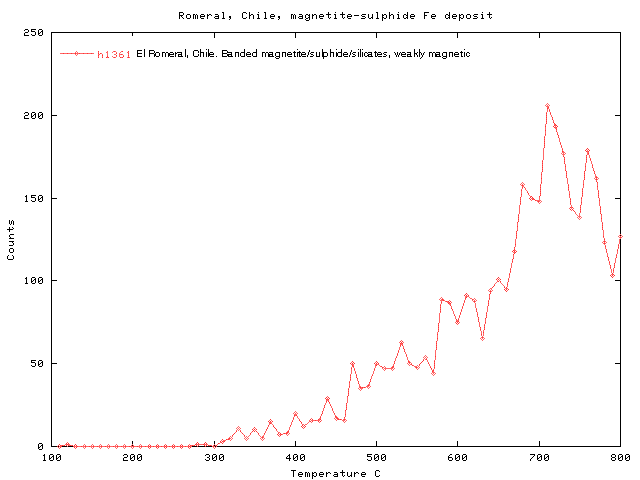 Nearby barren, magnetite bearing host rocks usually have negligible decrepitation. Tennant Creek, NT, Australia. Au, Cu in magnetite-haematite-chlorite host rocks. The Tennant creek goldfield has been proposed to be of sedimentary origin, with haematite secondary after primary magnetite. 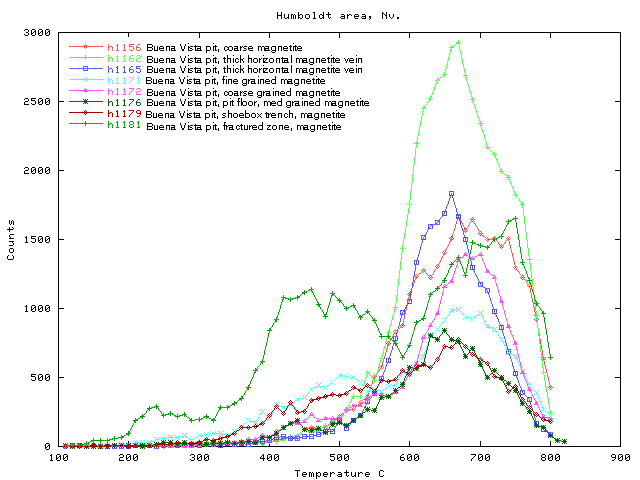 However, the rich ore bearing magnetites have intense decrepitation at high temperatures and many haematite samples also decrepitate. Consequently it is suggested that these deposits have a hydrothermal origin. Kingsley Burlinson, Burlinson Geochemical Services, Darwin NT.